Choose a color combination that perfectly goes with your skin and body type. Since you are choosing a kanjivaram for wedding, opt for darker yet brighter colors. Choosing the same color as a whole will lend you a tall look. If you want to look thin, try dark shades like royal blue and indigo. The best is to choose two colors with identical hues. For instance, red with a hint of pink and gold will look mesmerizing. The embellishments on a kanjivaram saree can really enhance your look. For instance, if you are on bulky side, try to pick a saree with less embellishments overall and go for a heavy border instead. Otherwise, you can go for bright colored kundans, zari borders in copper or gold shades and glimmering sequins to stand out and make a lasting impression. When it comes to choosing prints, go for vertical prints over horizontal ones since you don’t want to look plump. Printed kanjivarams with borders and buttas look really eye-catching. Embroidered blouses add richness to the whole ensemble. If you want to go for contrasting saree and blouse combination, don’t think twice. In fact, red and green is one combination that stands out. For instance, you can see this red and green kanjivaram saree with green blouse and rose motifs. If you want to try fusion dressing, then wear kanjivaram saree in lehenga style for your wedding. North meets south perfectly in this style of draping it like a lehenga. 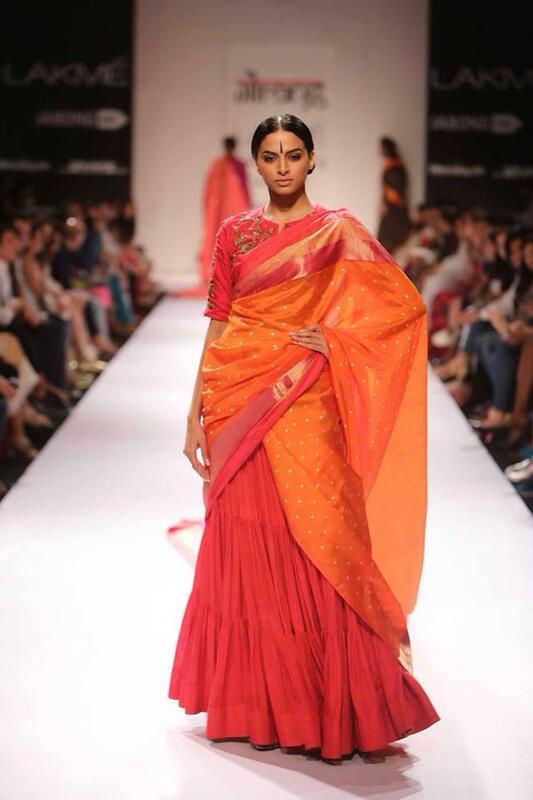 You can drape the saree with tiered pleats to enhance the whole look. A rich pallu with heavy sequin work will look gorgeous. 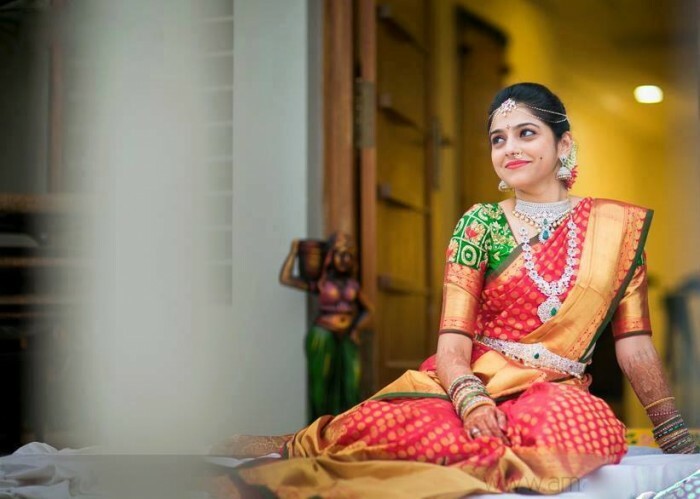 If you have chosen a kanjivaram with an elaborate pallu, you can show it off by keeping pallu on the front instead of back like in Gujrati style. This style will work for people who are little on heavier side. If the kanjivaram saree has rich and heavy border, you can style it up in Mumtaz style drape. It will also make you look curvier and show off the awesome figure. A gold belt can be an amazing addition to your kanjivaram saree. The moment you are done draping it, pleat the pallu and secure it with pins. Now bring the tip of the pallu to the front and tuck it near the waist. Now you can show off the gorgeous gold belt.